The Habitat for Humanity Mankato ReStore is a non-profit home improvement store and donation center that sells new and gently-used products and building materials. We need your donations. Individuals and businesses who donate appliances, furniture, building materials and more give items a second life. You also receive a tax deduction, and most importantly, provide funding to help build homes for those in need in our community. We receive new and gently-used donations from individuals, building supply stores, contractors, home builders and property managers. Donations made to the ReStore are tax-deductible. All ReStore proceeds support Habitat’s mission of providing affordable housing for those in need. Plus, you’ll be keeping good, reusable items in use and out of landfills. 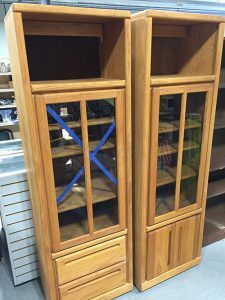 Consider Mankato ReStore when you're looking to donate appliances, furniture, building materials and more. You can have a permanent impact on your community by supporting the Habitat ReStore Capital Campaign. By buying a brick, you are contributing to affordable housing in your community. You also help the Mankato ReStore's efforts at reducing the demand on local landfills and providing inexpensive home improvement materials to local homeowners. 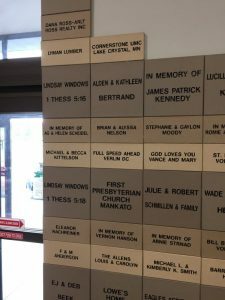 Brick donors' names are placed on the front wall of the ReStore, near the entrance. 4" x 8" bricks: $100 ea. | 8" x 8" bricks: $250 ea. Donate goods to the Mankato ReStore to clear clutter and make a difference. We accept appliances (less than 10 years old), cabinets, doors, electrical items, furniture, tools (power and hand), hardware in good quantities, light fixtures, lumber, paint (full or mostly full), plumbing, roofing (shingles/full bundles), tile, and HVAC. Drop off during regular ReStore hours, or for larger items, schedule a pickup. Families who partner with Habitat build their own homes alongside contractors and volunteers, pay an affordable mortgage, and are grateful for your help. Questions about donating to the ReStore?